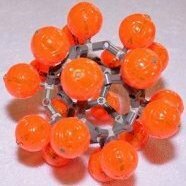 Video shows an older, less finished version, but the functions are the same. Very nice. The wings remind me of the Concorde a bit. I like it. will you be making instructions for it ? Wow, that is awesome! Any chance of bottom picture? The LDD file is 90% complete so sharing instructions is possible, if I ever find time to finish the file. Nicely done, especially considering its all from just a single set. Lovely! Very solid as opposed to 8480. I built the shell first (it practically built itself in about an hour) making stuff move took quite a bit longer. Great job, I like the repurposed propellers. AWESOME! That is the best C model for this set I've seen so far! It's like mini 8480! Can you make instructions please? Great job! 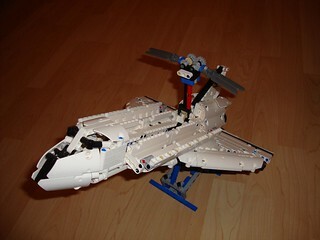 Plenty of white parts in the 42025, put to good use. I like this C model ! Wonderful Shuttle!!! Like it very much! That should have been the official b model imo. 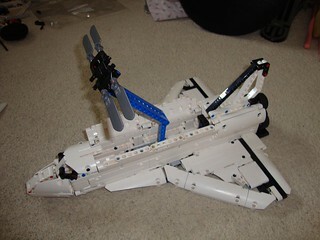 I was waiting for a new space shuttle and you built it. Great! Was TC5 a C-Model comp? Really a great C model! Hope you finish the instruction soon! Back on topic: it will look much better with white pins and axles but I am afraid they either don't exist or they are two rare. Now make the SRBs and the external tank! Good idea and nice work. I'll try to build it. Very nice work! 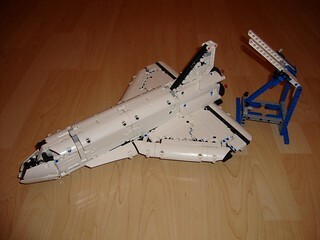 I need to get another 42025 to build this! Awesome! 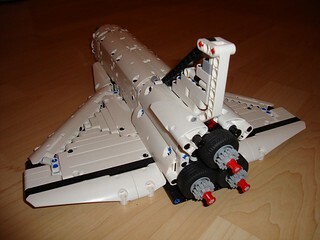 Put it on Rebrickable, lots of people would love to build this!